Lemons are an underrated ingredient in my book. Their cheerful yellow color brings a bit of sunshine to cold fall days and their acidity adds a delicious brightness to pretty much all foods. When the weather went from lovely and warm to frigid and depressing in the past two days, I busted out one of my favorite lemony, healthy and quick dinner recipes to fend off the chill. I generally keep a bag of frozen shrimp in the freezer. Take a few out of the bag, let them sit in a bowl of tepid water for a few minutes and you can use them as a last minute protein addition for most meals. Oven-roasting at high temperatures is a fantastic way to cook most vegetables. It concentrates their sweetness and doesn't give you a limp, soggy texture like boiling would. 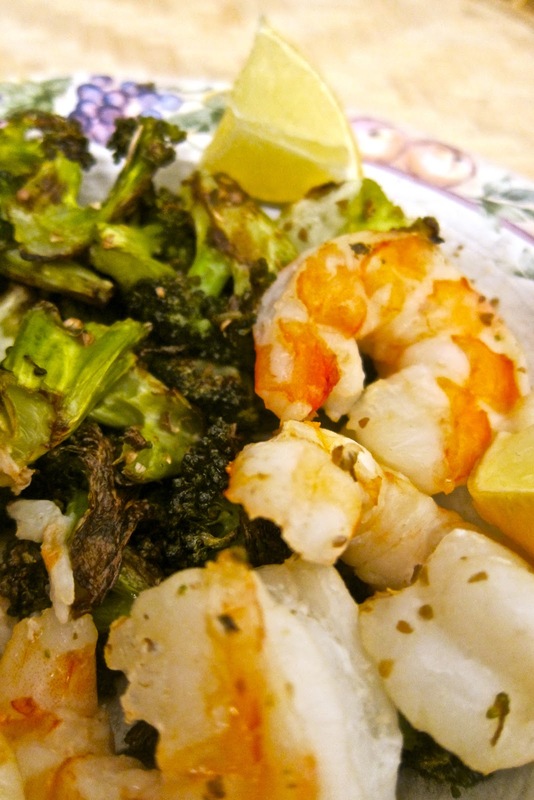 Here, the shrimp are tossed into the roasting pan with some broccoli, which browns and caramelizes beautifully in the oven. The whole thing is jazzed up with some spices and shocked alive with some lemon juice. It takes less than 30 minutes from start to finish and if you line your roasting pan with foil, you won't even have any clean-up! Adapted from here. You can serve this with rice or as is. One or both of the spices can be substituted with garam masala or curry powder. Don't waste the broccoli stems! You can peel them and chop them up with the rest as long as you cut off the small woody bit at the end of the stalk. One head of broccoli might seem like a lot for two people, but it loses a lot of volume in the oven. Serves 2. 1) Preheat oven to 425F (215C). Line an oven tray with foil. 2) On the tray, mix the broccoli with 1 tbsp olive oil, salt and freshly ground black pepper. Spread out on a single layer and roast for 10 min. 3) Push the broccoli to one side of the tray. Add the shrimp to the other side and toss with 1 tbsp olive oil and salt and pepper. Toss everything together, then mix in the spices, spread everything in one layer and roast for 5 min. Mix, turning the shrimp over, and roast for another 5 min. 4) Serve with a generous squeeze of lemon juice on top.